Don’t give up hope – I will help you! Are you looking for an experienced DUI attorney in Atlantic, Bergen, Burlington, Camden, Cape May, Cumberland, Essex, Gloucester, Hudson, Hunterdon, Mercer, Middlesex, Monmouth, Morris, Ocean, Passaic, Salem, Somerset, Sussex, Union, or Warren County? If you, or a loved one, have been charged with DUI we may be able to help. 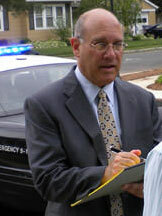 Richard R. Uslan, Attorney provides legal representation in Atlantic, Bergen, Burlington, Camden, Cape May, Cumberland, Essex, Gloucester, Hudson, Hunterdon, Mercer, Middlesex, Monmouth, Morris, Ocean, Passaic, Salem, Somerset, Sussex, Union, and Warren Counties and the entire Bridgewater area. Richard R. Uslan, Attorney handles all criminal cases including DUI charges. If you have been charged with a DUI, call our office now for a free case review (908) 725-1200. If this is an urgent matter please call (908) 725-1200. Richard R. Uslan has been a distinguished and respected municipal court and criminal law trial attorney for over thirty-five years, beginning with his defense of criminal defendants in appellate matters before the United States Court of Appeals for the Third Circuit in Philadelphia, Pennsylvania in 1978. He was also named as a Certified Municipal Court Trial Attorney, by the New Jersey Supreme Court - an honor held by only a small percentage of attorneys in the state. During his time as an attorney, he has personally represented several thousands of clients in every county court, and in almost all of the over 500 municipal courts in the State of New Jersey. In addition to being featured in legal, State and Local news publications, he has appeared as an expert legal commentator on the nationally broadcast ABC-TV News Magazine “Nightline”, on WCBS-TV – New York (Channel Two) and on the nationally syndicated “Joey Reynolds Show”, broadcast from New York City on WOR-AM Radio. In addition to his membership of the Bar of the State and Federal Courts of New Jersey, Mr. Uslan is admitted to practice before the Supreme Court of the United States in Washington, D.C.; the United States Court of Appeals for the Third Circuit in Philadelphia; the United States District Court for the Southern District of New York in Manhattan; the United States District Court for the Eastern District of New York in Brooklyn; the Bar of the State of New York; and has previously been admitted pro hac vice to the United States District Court for the Eastern District of Pennsylvania in Philadelphia. He is a Distinctive Scholar graduate of the University of Wisconsin – Madison and from New York Law School.